Dîner en Blanc is one of those bucket list items. At least it was for me when I first read about the magical white dinner years ago. I hoped that one day I would be lucky enough to observe the oh-so-French event, never dreaming that I would actually attend one. 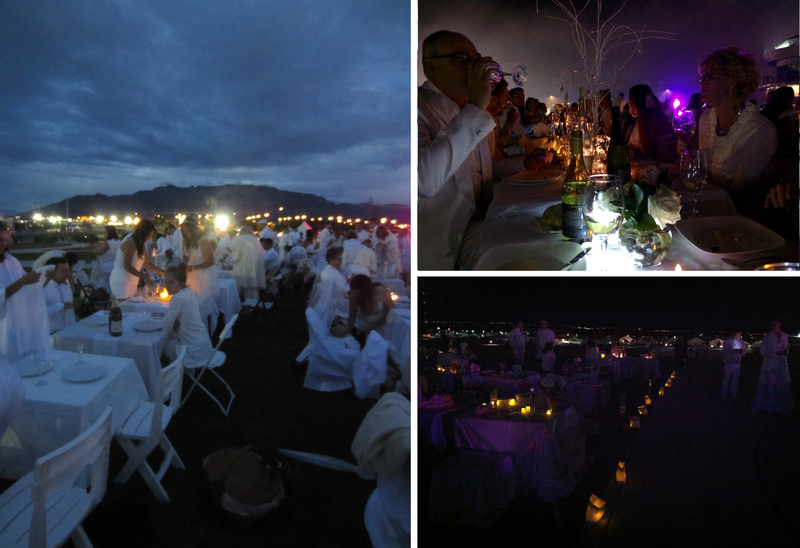 That all changed last night when Albuquerque, NM played host to its first-ever Dîner en Blanc. The secret flash mob-style dinner party traces its roots back to Paris in 1988 when a man by the name of François Pasquier wanted to host a dinner party to reconnect with friends after returning from abroad. He instructed them to meet at the Bois de Boulogne park in the 16th arrondissement and dress in white so they could find each other. To call Dîner en Blanc a picnic would be an understatement. Fast forward 26 years, the invite-only event has grown significantly, with more than 15,000 participants in 2014. 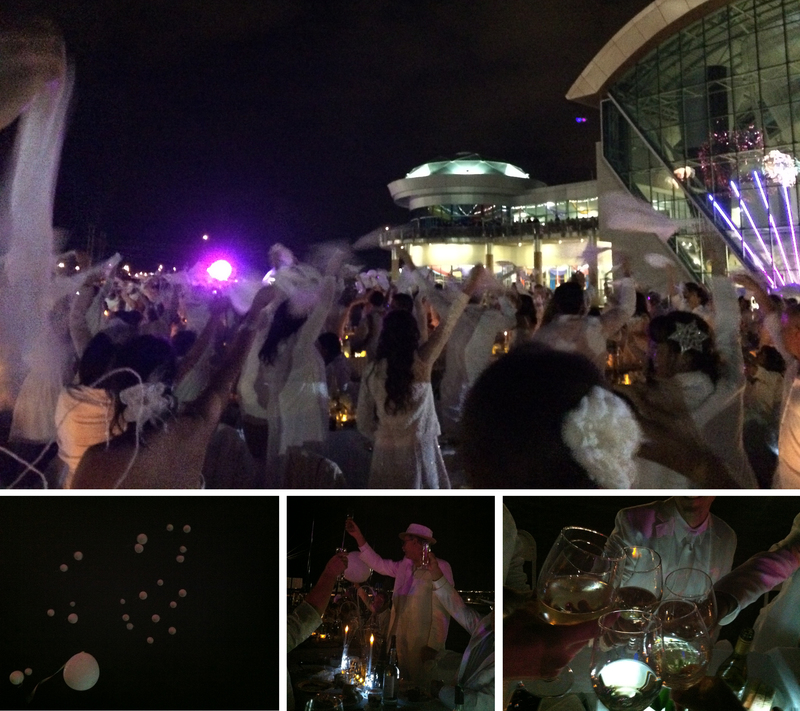 You can read more about the history of Dîner en Blanc here. What makes the event unique besides its strict all-white dress code is its top secret location, which is revealed at the very last moment. Each year attendees dressed to the nines have temporarily taken over some of the city’s most beautiful public spaces for one night – places like Notre Dame, the Louvre and most recently the bridges over the Seine River. And even though the location changes annually, the concept remains the same, with rows of tables as fancy as their owners systematically assembled for a picture-perfect white diner party right out of a fairytale. 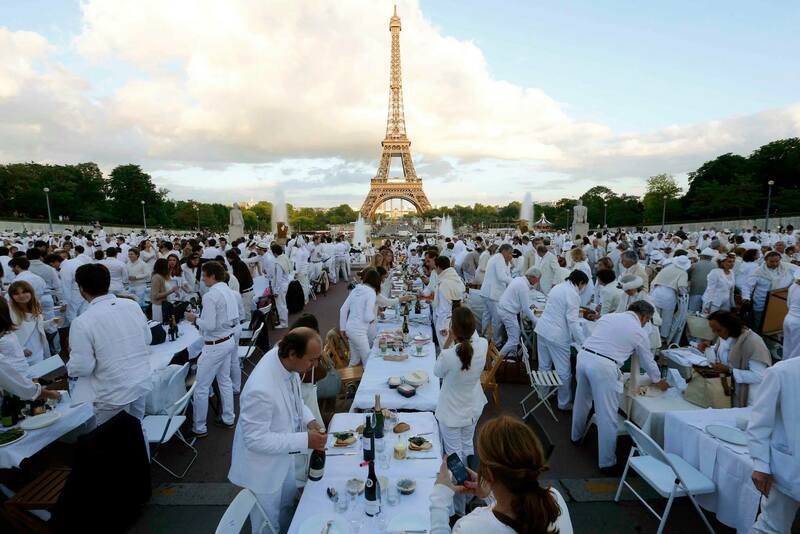 Dîner en Blanc has expanded in recent years to more than 40 cities around the world, each preserving the pomp and circumstance of their Parisian predecessor. In Albuquerque, which was one of only 19 cities in the U.S. to host the event this year, nearly 800 people dressed in head-to-toe white boarded 24 buses that departed from 4 locations around the city, converging on the Albuquerque International Balloon Fiesta Park. 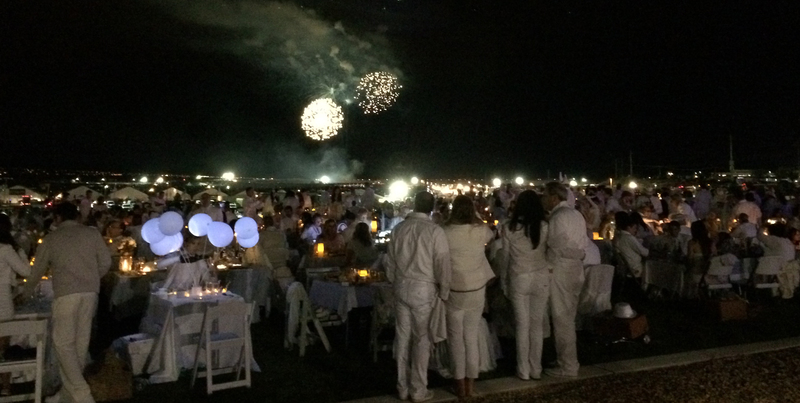 The city’s annual Balloon Fiesta is already a sight to be seen (and one of the most photographed events in the world), but last night’s Dîner en Blanc took it to a whole new level. Under cloudy skies and a firework display in the background, each couple set their table with white linens, glassware, elaborate centerpieces and plates for their gourmet meal. The rows of tables were capped with luminarias, a uniquely-Albuquerque touch. A napkin twirl marked the start of the evening and the successful occupation of the space, and white balloons were released into the now-dark sky. A gentleman two tables down proposed a toast for our row – to smiles – I know I certainly was wearing one the entire night. After dinner was complete we lit sparklers and the crowd was aglow, adding another layer of magic to the evening and kicking off a dance party that included a spontaneous limbo and a group-wide conga line. Then like a page from Cinderella, as the clock struck 11:00 a trumpet sounded and participants packed up the remains of their dinner before re-boarding the buses, leaving the space like nothing happened. 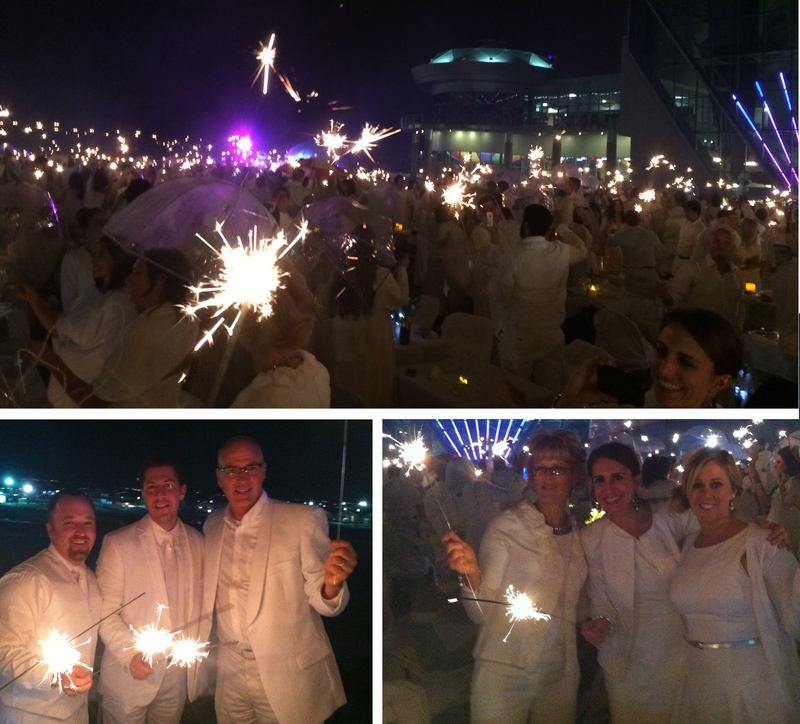 Dîner en Blanc is truly a pinch-me experience. After it’s over, it leaves you wondering if the whole thing was really just a dream. For more information and to see if Dîner en Blanc is coming to you city, visit dinerenblanc.info.